A Wendy's fast food restaurant in the small town of Firestone, Colorado has been chosen as the best Wendy's in the world. It won over other finalists in Charlotte, NC, Valdosta, GA, and Auckland, New Zealand. The Wendy's were judged on quality, service, cleanliness, food safety and leadership. The manager of the Firestone, CO Wendy's, Vance Gray (pictured with his award) won a new Pontiac Solstice convertible. The management team and crew will also receive more than $15,000 in prizes, but Grays says it's more than just about the prizes. "For some of my teenagers here they're 16 and 17 years old. For me to go up and say, ‘You know what? You're the best in the world at what you do.’ That can inspire them for a lifetime,” said Gray. 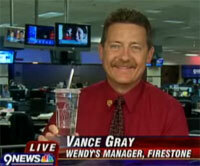 Here's an interview with the winning Wendy's manager Vance Gray on Denver, Colorado's NBC affiliate KUSA-TV Channel 9. WOW. I'd love to know how he motivated the typical teen crew to go beyond the minimum, even for the minimal pay. He should look into instructional training.